Regular readers are no doubt familiar with some of the images shown below. The “neck bird”, which was photographed in our old search area in August 2009, has been discussed in a number of posts. I think it likely shows a female Ivory-billed Woodpecker, something that became clearer once I satisfied myself that what appeared to be red in the crest (in the wrong place for either Pileated or ivorybill) was likely an artifact and that the crest appears to be all black, as shown in the enhanced image below. The original captures (the first taken a minute before the neck bird appears and the second showing the neck bird) are immediately below that for those who haven’t seen them. Years after the capture and probably after the first post about this image in 2014, I noticed that an object suggestive of a light colored bill was visible in both frames, apparently protruding from the lower cavity in the snag to the right of center. While I have shared this information privately with a number of people and did a vague Facebook post about it a couple of years ago, I’ve hesitated to blog about it or discuss it in detail. That changed after I showed it to Jay and Erik before we parted company on my last trip to Louisiana. When Erik suggested that the object might be a vine or some other intervening vegetation, I decided to go back through my files. I discovered that Frank had sent me several additional captures from the same deployment. I examined these frames and found that the apparent bill was absent from all of them. Below are details from frames 1095 and 1096 showing the apparent bill, which changes position slightly from one frame to the next. The time lapse interval between images was 1 minute. Again, the cavity in question is the lower one (below the fork) in the snag to the right of and behind the one on which the neckbird is seen in 1096. These snags are black willows (Salix nigra), and the neck bird snag (with the large cavity apparently being used by a squirrel) fell between November 2009 and January 2010. I’m also posting the close-ups in tiled mosaic format so they can be viewed side-by-side. For this round of image processing, I used Let’s Enhance, which enabled me to retain a large format for cropped and zoomed versions. Detail from 1096, captured one minute later. Note slight change in position of the possible bill. Next are two details from images captured a few days later. The possible bill is nowhere to be seen. The same is true for the other captures from this deployment. Thus intervening vegetation and artifact can be ruled out. Detail from image 2135, captured August 14, 2009. Note the absence of the apparent bill that appeared in images 1095 and 1096 captured three days earlier. Detail from Image 2507, captured on August 16, 2009. Again, note the absence of any object in the lower cavity. If this is a bill, it appears to be large and light colored, consistent with Ivory-billed Woodpecker. Both Erik and I noticed that, in frame 1095, a topmost part of the white dorsal stripe also may be visible. When Jay first saw the photos, he was reminded of the Neal Wright photos from Texas. Some images from the Singer Tract also come to mind. Thus, this apparent bill resembles those of known ivorybills in cavities – in size, shape, orientation, and contrast. It is present only in frames 1095 and 1096 (the latter of which shows another possible ivorybill); it changes position over the course of a minute, from one frame to the next. There is no way to be sure images 1095 and 1096 show an Ivory-billed Woodpecker in a roost hole, but these facts, especially taken together, suggest that they may. When I look back at what transpired in the old search area between August 2009 and November 2010, when the adjoining parcel was logged, it’s extraordinary. I may revisit those events in a future post or two. For now, I’ll close by tying this into the Bits and Pieces series. The old search area is not one that would be deemed suitable under most habitat models. The images above were captured in a stand of black willows at the edge of a bean field. The other trail cam capture, where I had a sighting, was also within perhaps 30 yards of that field. When I look back at my assessment of the habitat from the time, I think I somewhat naively overstated its quality; however, there was a good deal of dead and dying timber, and it was in close proximity to several much larger habitat patches. If we did indeed capture ivorybills with our trail cams, their presence in this area may point to how the species has been able to adapt to more fragmented habitats. Thanks to Erik Hendrickson for his input on this post and his help in making it clearer. In searching Cornell University’s online digital archives, I ran across some IBWO related photographs from the 1935 Allen/Kellogg/Tanner expedition in the Albert Rich Brand collection. Many of these pictures are familiar and have been widely published. Others are likely to be new, even to the most obsessive researchers, since Brand was a relatively less celebrated member of the expedition. 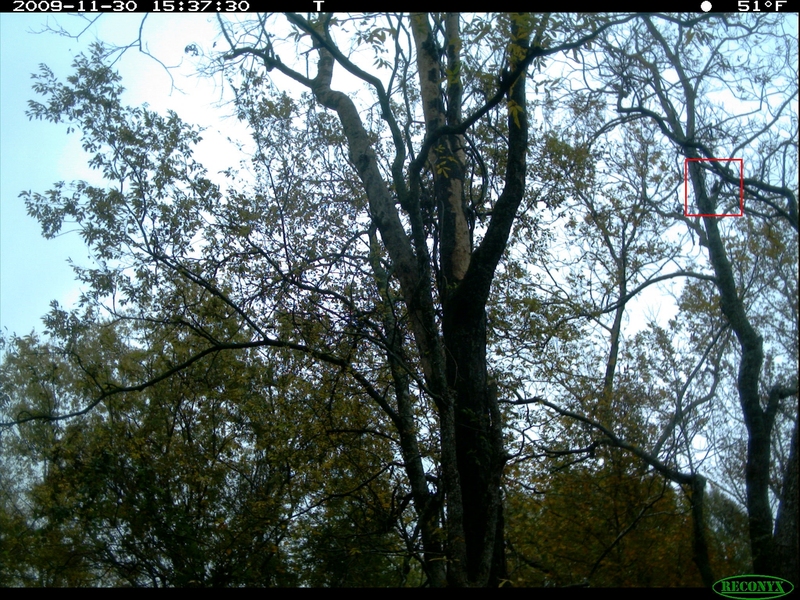 One of the more interesting images shows a nest cavity near the top of a very long dead pin oak. This appears to be one of the two nest trees found by Allen and Kellogg and listed and discussed by Tanner, pp. 67-70. The typewritten caption on the photograph reads “The third Ivorybill’s nest. . .”, although Tanner only mentions two. The quality of the photograph is poor, but it is interesting because the stub is clearly long dead. For my purposes, the most interesting photograph, titled Rock Elm Observation Blind shows the better known nest tree (a maple) from a different perspective than the published photos and includes more of the trunk than the others I’ve seen. I downloaded the image, and enlarged it as best I could. Readers can do the same. On close examination, a bill is visible protruding from nest cavity, making this a modest addition to the body of ivorybill photographs. What I find most significant is the appearance of the scaling on the bole. While the condition of the underlying wood seems to be considerably worse than what we are deeming to be grade A scaling, the similarity in appearance is dramatic, especially on the edges. The resemblance between this work and the scaling found in July in the northern sector is particularly striking. Edited to add: All the digitized Brand collection images are here. They’re worth a look. In addition, I’ve found a hand tinted version of “Rock Elm Observation Blind” in the Arthur A. Allen collection, under the title “Ivory-billed Woodpecker – Blind at Nest“. Although the colors are slightly washed out and smeared, the bird in the cavity is a little easier to see, and the similarities between the scaling on that tree and the scaling we’re finding are a little more evident, at least to my eyes. Wishing everyone the best for the holidays and the coming year!